Atmel START is a web-based software configuration platform that helps you to get started with developing your applications on Atmel 8-bit and SMART ARM®-based microcontrollers. It also supports a wide variety of embedded drivers, example projects, and middleware software. 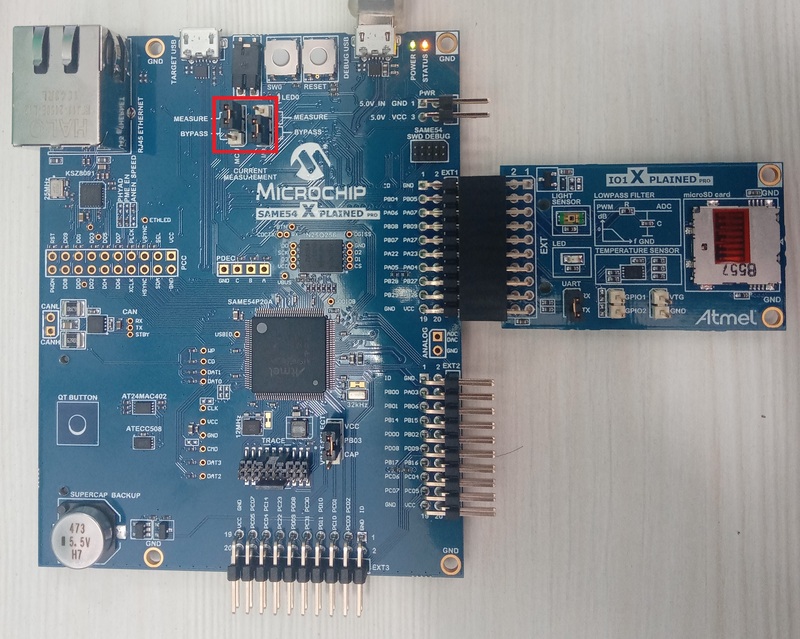 This tutorial shows you how to add a Real-Time Counter (RTC), Analog-to-Digital Converter (ADC), Universal Synchronous and Asynchronous Receiver and Transmitter (USART), Direct Memory Access (DMA) and EVENT SYSTEM drivers to your Atmel START project. You will use the SAME54 Xplained Pro Evaluation Kit and I/O1 Xplained Pro Extension Kit extension board (sold separately). Create the project from scratch. Use the provided source files and follow the step-by-step instructions given below. Use the solution project as an example. Just build the solution project and download it to the SAME54 Xplained Pro Evaluation Kit to observe the expected behavior. Create an Atmel START project from scratch for the SAME54 microcontroller. Add RTC, ADC, USART and EVENT SYSTEM drivers to your project. Open the project using Atmel Studio. Reconfigure existing project by configuring DMA driver. Add application code to the generated project. The Xplained Pro series evaluation kits include an onboard Embedded Debugger (EDBG). No external tools are necessary to program or debug the ATSAME54P20A. The EDBG connects to the host PC through the USB micro-B connector on the SAME54 Xplained Pro Evaluation Kit for programming/debugging. Connect the I/O1 Xplained Pro Extension Kit to Extension Header 1 (EXT1) of SAME54 Xplained Pro Evaluation Kit. Set the I/O current measurement jumper to BYPASS option (to disable I/O consumption information), as highlighted in the Hardware Setup figure. Set the MCU current measurement jumper to MEASURE option, as highlighted in the Hardware Setup figure. This is during current consumption measurement since we are interested only in MCU consumption using the Data Visualizer. Connect a USB cable to the DEBUG USB port for programming. Atmel Studio 7 (Version: 7.0.1645), ARM/GNU C Compiler :6.3.1, SAME54_DFP (Device Family Pack) :1.0.67, Atmel START and Atmel Studio Data Visualizer extension version 2.15.713 or later. Because we regularly update our tools, occasionally, you may discover an issue while using newer versions. If you suspect that to be the case, we recommend that you double check using the same versions that the project was tested with. Note that you don't need to separately install the IDE, ARM GCC Compiler, and Data Visualizer. Installing Atmel Studio installs them all. This lab shows you how to create a project from scratch, add drivers, and use the event system to drive the events received from the peripherals without intervention from the CPU. Device is operated in sleep mode. RTC is configured as an Event Generator to generate periodic (every 1 s) event to trigger the ADC to start a conversion through the EVENT SYSTEM. 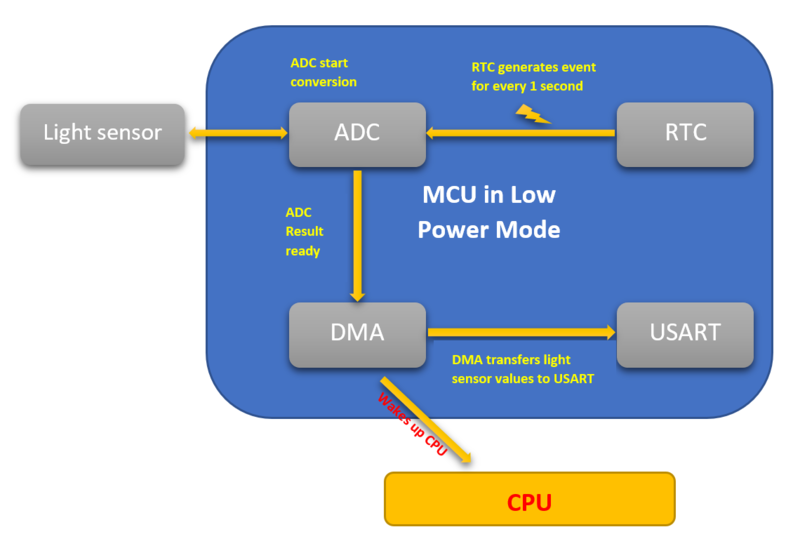 ADC acknowledges the event from the RTC and starts a conversion of the light sensor present in Atmel I/O1 Xplained Pro Kit. DMA moves the conversion result from the ADC RESULT register to the USART DATA register and raises the DMA transfer complete event. CPU wakes up and re-enables DMA for next transmission. Configure Clock and Drivers: The function system_init initializes the SAM E54 system clock, drivers, and EVENT SYSTEM. Enable ADC: The function adc_async_enable_channel enables the ADC module. Configure and enable DMA: The function configure_dma configures the DMA transfer from the ADC RESULT register to USART DATA register and enables DMA transfer. Enable USART: The function usart_sync_enable enables the USART module. Start the timer: The function timer_start starts the timer. The function sleep configures the device to sleep mode. 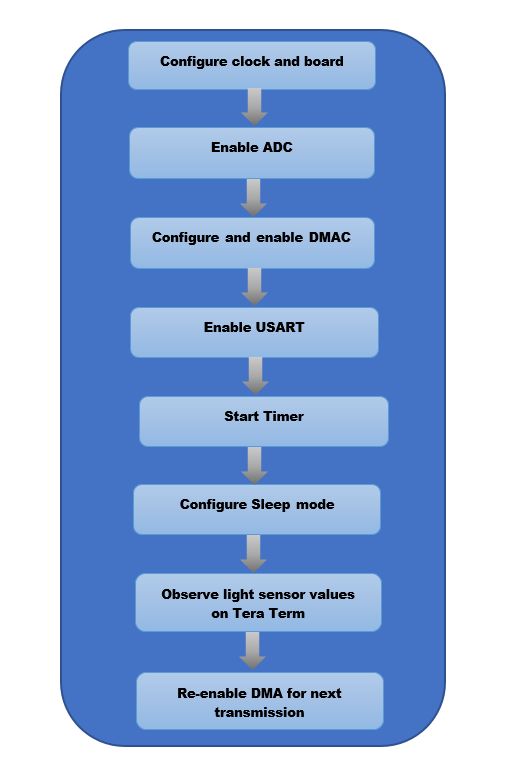 Observe light sensor values on TeraTerm. Re-enable DMA for next transmission. Figure 1.1 shows the flow sequence of the application task. This ZIP file contains the completed solution project for this lab. It also contains the source files needed to perform the lab as per the following step-by-step instructions (see the "Procedure" section on this page). The contents of this ZIP file can be placed in a folder of your choice, preferably in a top level folder of a drive. event_based_drivers contains the lab folder event_based_drivers_lab. event_based_drivers_lab contains the complete lab solution (event_based_drivers_lab.atsln and related files under sub folder event_based_drivers_lab). dev_files contains application source files and other support files (if any) required to perform the lab from scratch (see the "Procedure" section below). event_based_drivers_lab.atsln is the completed lab solution project. It can be directly built and downloaded on the hardware to observe expected behaviour. All steps must be completed before you build, download, and run the application.